There’s nothing like being on TV. And there’s nothing like being on a popular TV show. People have actually stopped Chris on the street after this episode aired, which he finds funny. Officiant Guy, Chris was the wedding officiant on Bridezillas Episode 10 featured Kristina and Robert as bride and groom. Kristina was the bridezilla who was dealing with her mom who needed a significant amount of attention and her sisters who had some jealousy issues. Chris was shown on camera kindly offering his own wedding ring to Kristina when she realized that she had forgotten to bring the wedding ring for her groom. During the wedding ceremony, Chris kept his cool while Kristina broke down and wept about her deceased father. It was a very emotional marriage ceremony in Los Angeles. The Officiant Guy, again, was a calming influence. 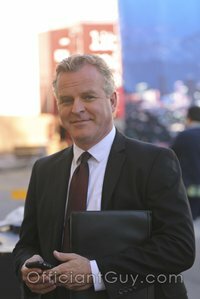 If you have been web searching for wedding officiant Los Angeles consider why Chris is the most favored wedding officiant for televised weddings. 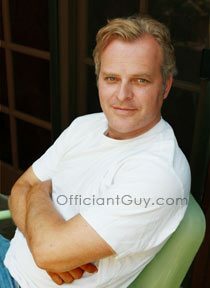 The producers and entertainment attorneys know that he is the best wedding officiant in Los Angeles! Do you need a wedding officiant in the Los Angeles area? Or an officiant anywhere in Southern California from San Diego to Santa Barbara to Riverside…it’s up to you. And he can bring a marriage license to you. He’s the best wedding officiant in Southern California. Chris Robinson is a California nondenominational wedding minister. He has been performing wedding ceremonies and delivering California confidential marriage licenses for over two decades. If you wish to get married somewhere in LA County give the best ceremony officiant in Southern California a telephone call at (310) 882-5039 or (562) 547-3255 or fill out the contact form.